The pearl is fixed onto a pin. 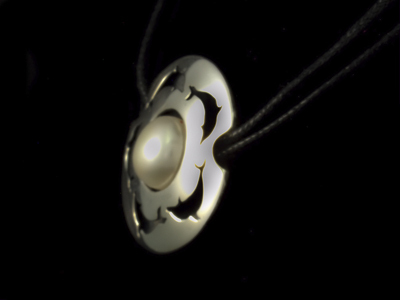 It's a creamy white freshwater pearl, about 11mm diameter with a slightly flattened top. The inside of the piece is patinated black with liver of sulphur, so the dolphins really show up clearly. To keep the lines smooth, I have mounted it onto the cord through two holes in the sides - the back is completely smooth, save for the hall-marks. Silver chain would have been visible behind the dolphins, so I have set it on a 14" double strand of black leather cord, to be worn choker-style. I shall always remember visiting a dolphin sanctuary. One of the dolphins had a new calf, and she was swimming along with her offspring glued to her side. What was so truly memorable was that each time she came along in front of us, she would roll over slightly, causing her calf to rise up to the surface. There was no doubt: this was one glowing mother showing off her pride and joy. Back to the jewellery... At first, you might think that this is just a flat sheet of silver with the dolphins pierced out. But then you might wonder how the pearl is attached. In fact, the piece is made from two discs of silver, each one slightly domed and then soldered together, to make a little 'flying saucer'.